Kristen Confroy, a senior biological sciences major and a guard on the women’s basketball team, came to the University of Maryland because she could play the sport she loves and take courses to become a doctor. 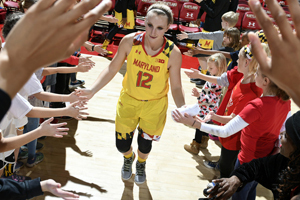 “Early on in my career, I would tell people that I’m pre-med and I play basketball, and they would say there’s no way you can do that,” said Confroy, who credits Maryland Women’s Basketball Coach Brenda Frese with encouraging her to pursue both goals while coaches at other schools told her it was impossible. Confroy proved her doubters wrong—she will begin medical school at the Wake Forest School of Medicine in the fall. On the basketball court, 3-point shooting is Confroy’s specialty. During her sophomore year, she made 73 3-pointers—more than any other player in a year in Maryland women’s basketball history. In the classroom, Confroy maintains a 3.8 GPA. She has been named to the dean’s list every year and received a 2017 Big Ten Distinguished Scholar Award. To stay on top of her studies while managing a demanding basketball schedule that includes practicing from noon to 4 p.m. every weekday and traveling to games, Confroy became an expert in time management. Confroy became interested in medicine while in high school. While some of her teammates dealt with sports injuries, she became aware of the impact doctors have on players’ lives. She also realized that a career in medicine would allow her to remain involved in sports, even if she wasn’t playing. After considering physical therapy and sports management careers, she shadowed an orthopedic surgeon and decided to pursue a career as a medical doctor. UMD helped cement Confroy’s love of medicine by allowing her to explore a variety of career paths. She read patient charts and performed pre- and post-operation checkups at Montgomery Orthopedics, observed operations at University of Maryland Orthopedics at College Park, and recruited subjects and performed blood tests for a research study in the laboratory of UMD Kinesiology Professor James Hagberg. Basketball also provided one of Confroy’s most formative medical experiences—her interactions with Ashlyn Barrett, a child with multiple serious medical conditions. Confroy and her teammates met Barrett through Team IMPACT, an organization that pairs children who have serious chronic illnesses with college athletic teams. Confroy and the team spend time with Barrett’s family multiple times a week, help fundraise to pay her medical bills and host events such as birthday parties to celebrate Barrett. As a result, Confroy is now leaning toward a career in primary care, which would allow her to develop long-term relationships with patients. As many female basketball players head for the WNBA or overseas after graduation, Confroy will hit the books in medical school. But she will still play the occasional pick-up game.